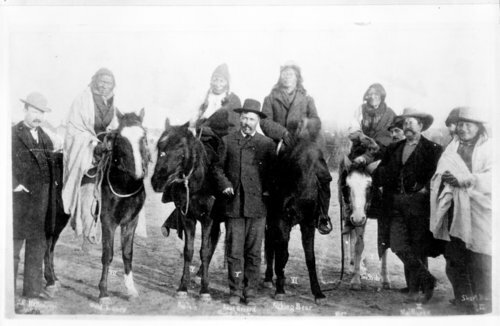 This is a photograph of a group of Cheyenne Indians, or possibly Sioux sitting on horses. Left to right the Indians are identified as Good Lance, Big Talk, Kicking Bear, Two Strike, and Short Bull. These men are a part of Dull Knife's group. Funds for digitization provided by Mr. Steve Peckel in memory of William Chalfant.